The WPF TreeGrid control displays hierarchical or self-relational data in a tree structure with a multicolumn interface like the multicolumn treeview. The WPF TreeGrid control is a data-oriented control that displays self-relational data in a tree structure user interface like multicolumn treeview. The data can be loaded on demand. You can move items between parent nodes by using the built-in row drag-and-drop functionality. Its rich feature set includes editing with different column types, selection, and node selection with check boxes, sorting, filtering and more. Binds any hierarchical data by specifying child mapping. Displays self-relational data in a tree structure specifying the parent and child mappings. Supports an unbound mode where the data is loaded on-demand. Use different built-in column types such as ComboBox, DateTime, and CheckBox. Embed any control, such as a progress bar or rating, to view or edit the data in a cell. Commit or rollback changes when the data object implements IEditableObject. Built-in data error indication and validation to Validate cells and display error information. Sorting - Sort data against one or more columns with multiple customization operations. You can also sort by writing custom logic. Filtering - Filter nodes programmatically with various filter-level options. Select rows or nodes with extensive support for keyboard navigation. Also, select rows using node check boxes. Perform clipboard operations such as cut, copy, and paste within a control and between other applications such as Notepad or Excel. Column width can be adjusted (autofit) based on the content of any column or column header. All the columns can be fit within the viewport of the treegrid. The appearance of a treegrid and its inner elements, such as rows, cells, columns, headers can be customized easily by using styles and templates. 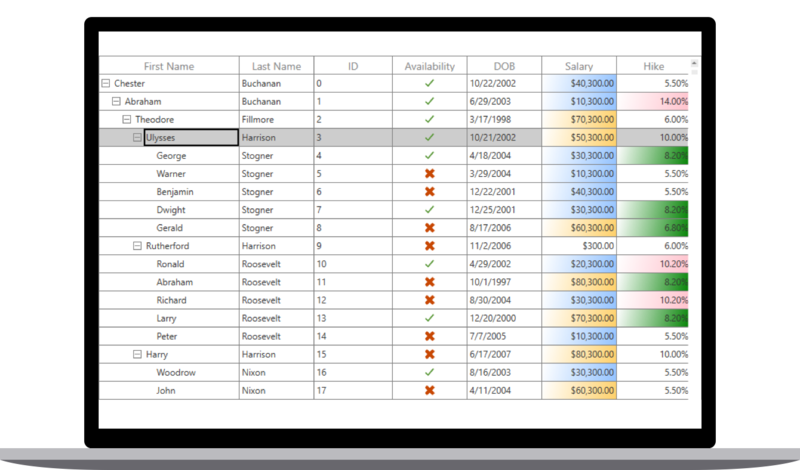 Drag and drop rows within a control or between controls with an intuitive drag and drop UI. Features a rich set of options for exporting data to Microsoft Excel file formats, PDF, and CSV.